The best white water in France for white water activities including kayaking, canoeing, rafting and hydro-speeding, with the big volume rivers of the Durance and Ubaye, together with the alpine rivers of the Guisane, Claree, Guil, Gyr and Onde. Excellent alpine mountaineering in the Ecrins National Park centred on Ailefroide, a few kilometres up valley from Vallouise, and La Berade, accessible from the other side of the range. Superb opportunities among the many rivers, cliffs and gorges for canyoning and during the winter ice climbing. Numerous cliffs at various locations allow for year-round rock climbing and Via Ferratas. 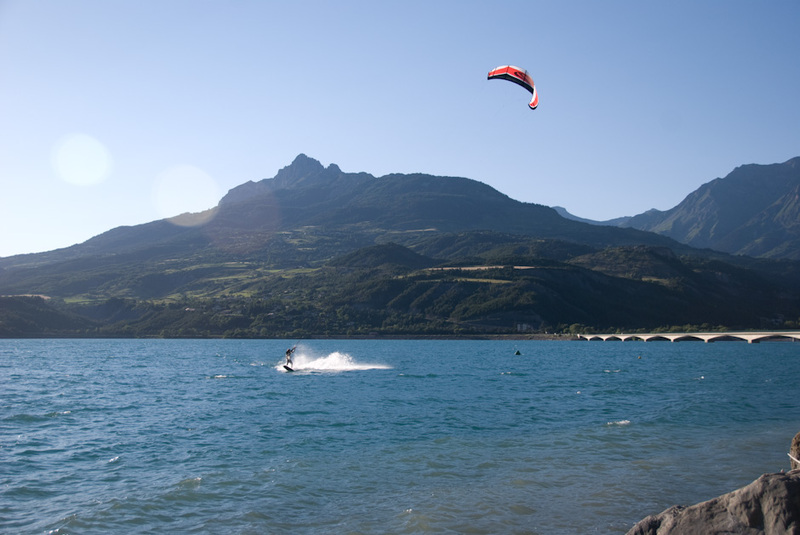 The Lac de Serre Ponçon at Embrun, with its thermal breezes for numerous water activities, including dinghy sailing, catamaran sailing, windsurfing, kite surfing and water skiing. High mountain cols – the Lautaret, Galibier, Izoard and Vars for cycle enthusiasts and the starting point for many mountain bike rides. High mountain cols – the Lautaret, Galibier, Izoard and Vars for cycle enthusiasts and the starting point for many made famous by the Tour de France. Alpine villages and valleys -Vallouise, Nevache, St. Veran – excellent bases for ski touring and mountain walking in the summer and ski touring or snow shoeing (raquetting) in the winter. Historical towns of Briançon (with the highest cathedral in Europe), L’Argentière-la Bessée, Guillestre and Embrun and the flora and fauna of the Ecrins and Queyras National Parcs for Special Interest Holidays. If you don’t want to go for a long walk and just want to go for a stroll either in a car or on foot but with beautifull views and blue skies have a look.